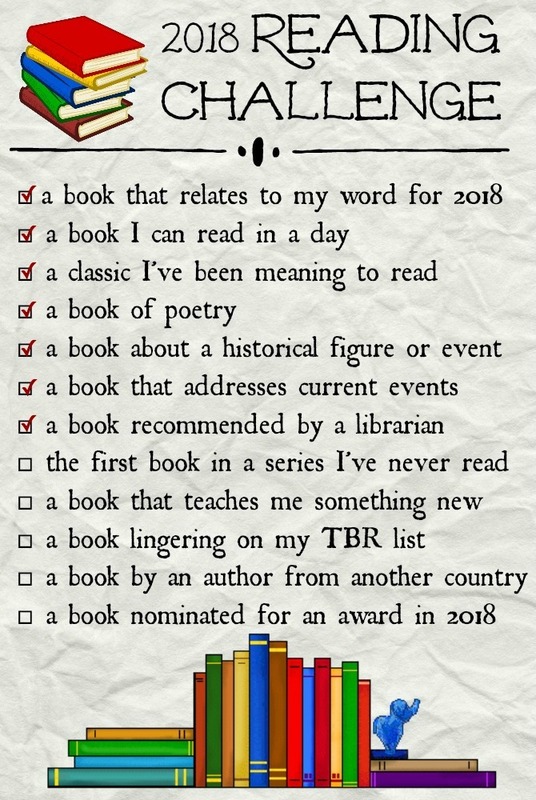 2018 Reading Challenge: A book recommended by a librarian. For as often as I frequent our local library, I spend remarkably little time talking with our librarians. I casually greet the children’s librarian when we arrive at story time each week, but that’s about as far as our interaction goes. I check out most of my own books online, and we use self-checkout when picking up books for Charleston, so not even that step involves personal interaction. My sadness over my underutilization of a library’s greatest asset (the people) is what led me to include “a book recommended by a librarian” as one of the categories for this year’s Reading Challenge. 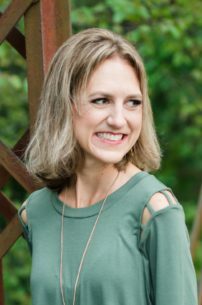 I rarely have trouble deciding on my next book selection, but I thought it would be fun to get some advice from a book professional. Prior to this month, I can only recall one instance of asking a librarian’s advice. It was last fall, and Charleston and I had just worked our way through the Llama Llama series. I was at a loss as to what to try next, so I approached the children’s librarian about suggestions for something similar. Unfortunately, she wasn’t much help; the only ideas she could come up with were the Froggy books, which did not go over well with my tiny reader. Since I’m easier to please than my son (in the book department, at least) I was hopeful that the librarians would have better suggestions for what I should read. I was more than a little nervous when I approached the Reference Desk a few weeks ago to ask for advice. I explained to the young librarian (a woman I regularly see, but had never spoken with) that I was participating in a reading challenge and was in need of some recommendations. I told her that I read widely and was open to any ideas. I was surprised when she didn’t ask any follow-up questions about my preferences, other than to ask, “how do you feel about fantasy and science-fiction?” And with that solitary question she’d launched me right out of my reading comfort zone and into new territory—EXACTLY what I was hoping for! The librarian threw out a few titles, but before I could respond she suggested that I head over to the children’s area with Charleston while she put together a list. Ten minutes later she caught up with us and handed me a Post-it Note with a handful of book titles jotted down. A few of the books were familiar—I’d even read a couple of them—but many were totally new to me. After doing some light research on each book, I decided to read the title that I was least likely to have picked up on my own. The book was a YA Graphic Novel; it doesn’t get more “different” from my usual taste than that! I’d never even set foot in the Graphic Novel section of our library, so just finding the book was a whole new experience! I’d had no idea how much floor space the graphic novels occupied in our small town library, but I eventually found what I was looking for. 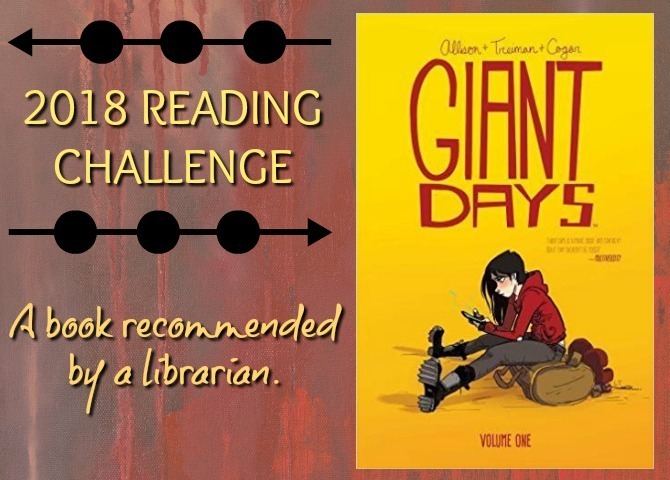 I’d always assumed that graphic novels were exclusively Science Fiction, Fantasy, or Superhero stories, but Giant Days is realistic YA fiction of the fairly standard variety. The beginning pages introduce us to three young women who began University three weeks ago and instantly became friends. The girls are as different as can be: Esther is cool, sophisticated, and an effortless boy-magnet; Daisy is sweet, naïve, and working out her suspected homosexuality; and Susan is a rough-around-the-edges tomboy and rabid feminist with a reputation for being very slovenly. During their first weeks away at school, the women encounter influenza, chauvinistic college boys (and professors), and illicit substances. They look out for each other and work to reinvent themselves while also remaining true to who they are. I’ll be honest, I had zero anticipation of liking this book. I rarely enjoy cartoons within the television or movie platforms (Disney movies being an exception), so I assumed I would dislike graphic novels, too. But this first graphic novel turned out to be a delightful surprise. Maybe it’s all the firsthand experience I’ve had with children’s picture books lately, but I loved the format: I tend to race through books as I read them, but the graphic novel forced me to slow down; I took time with the words and the pictures, which made for a relaxing reading experience. I was amazed at how much story fit into so few words, and how the illustrations and dialogue fit together to express a fairly complex plot. 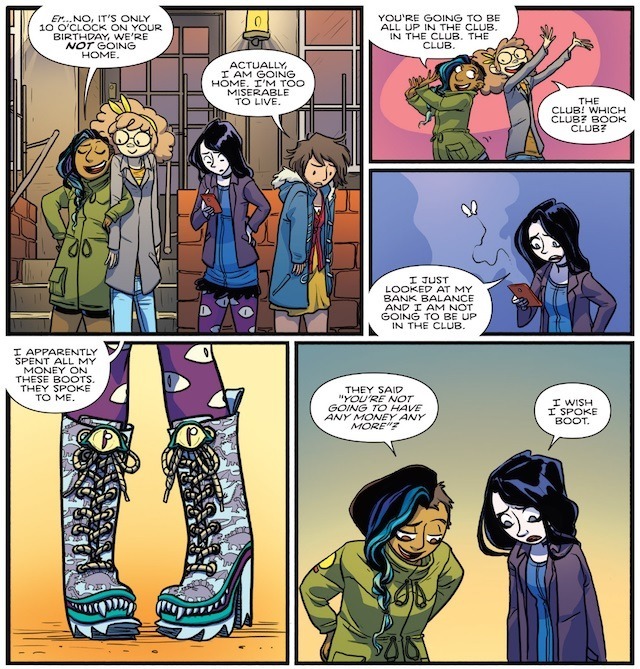 I can’t speak to how the art compares with other graphic novels, but I found the illustrations in Giant Days to be quite well done: colorful, detailed, cartoon-y but not in a kiddie way, and contributing to the character development in unique ways. 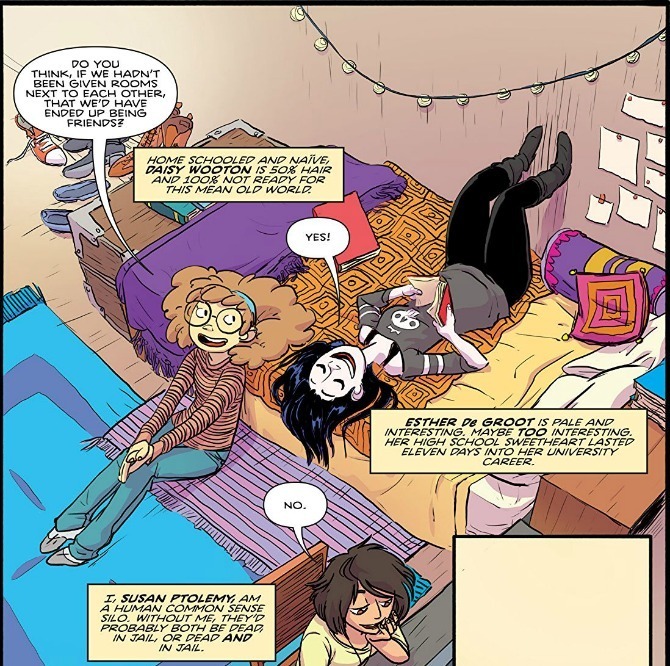 I’ve never been a fan of stories that take place in a university setting, so the fact that I didn’t particularly care for the storyline of Giant Days speaks more to my personal bias than the quality of the book itself. The story moves fluidly, and offers a fun little snapshot of college life and those awkward moments that it entails. The pages contain liberal doses of cattiness and angst, as one would expect from a book about college coeds. That said, I was impressed with the treatment of some more mature themes, particularly the balanced view of feminism and the positive portrayal of female friendship. I particularly enjoyed each of the protagonists, who are layered and not contrived or stereotypical. The book isn’t pure comedy, but it does feature some wonderfully wry humor and colorful commentary. I don’t know that I’ll continue with the Giant Days series, but I definitely hope to read more graphic novels. It will be interesting to see whether I truly do enjoy this format, or if this book was just an anomoly. Either way, I’d say that my librarian hit the nail on the head with this recommendation—exposing me to something new that I actually enjoyed. I’m so glad I overcame my librarian intimidation and will absolutely be seeking out more librarian recommendations in the future! 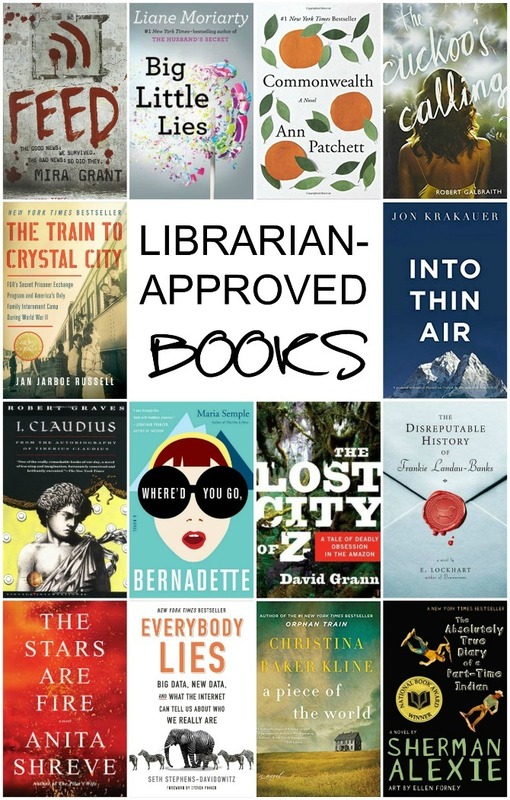 This list includes all of the books my librarian jotted down on her Post-It of recommendations. I’ve started the titles that I had already read—all excellent picks because I enjoyed each of those books. Have you ever asked a librarian for help picking out a book? What was your experience like? I’m also curious about your thoughts on graphic novels: have you ever read one? What did you think? Have you read any you think I might enjoy?